...faster sites get more conversions, page speed is a ranking factor used by Google and that users on Mobile expect pages to be as fast, or faster, than on their computers at home? Simply enter your website address in the box and click submit to see your pagespeed score. So What's Your Pagespeed Score? In the last few months I’ve spent a load of time building WordPress themes with Bootstrap. If you needed to you could easily build a whole themes from scratch in less than a day with it – that’s the beauty of front-end frameworks. Working with front-end frameworks really does take WordPress theme development to a new level. You can make some amazing things in a short period of time. Building a WordPress theme from scratch might be quite daunting, but trust me it’s really not. You only need a handful of different files. Most of the files are actually just html with some very basic WP specific php code and some styles. Getting things up and running with Bootstrap adds a few steps before you get started but it’s really nothing overly complicated so don’t worry. I’ll walk you through the whole thing, beginning to end. 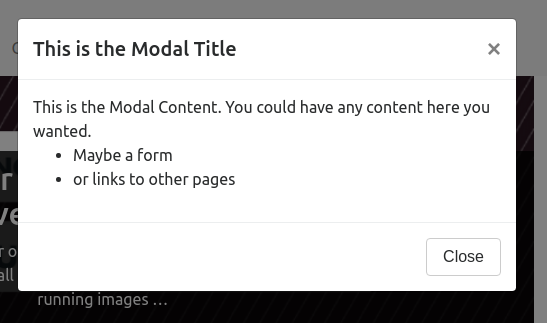 I’ve previously gone over the absolute minimum requirements for a theme before. You just need 2 files – style.css and index.php. To make it a Bootstrap powered theme you need a couple more files – the Bootstrap files. The easiest way for you to get Bootstrap is to go and download it from the official Github page, or clone and fork it if you want. I recommend you download it from the customize page with all the boxes ticked, that way everything will be compiled into just 4 files (with 2 being the glyphicon halfling images). If you download if from the homepage then you end up with multiple separate css files which you need to import separately, with it fully compiled it makes it a little bit easier. You can also include the fully compiled versions of the files from a CDN if you wish. Just so you know we will be using the full Bootstrap for development (all the css and js) but when it comes time to finish the theme I’ll walk you through removing any unused code to speed up your theme and slim down your code. When you open up your Bootstrap zip it will look something like this. You want to copy the css, js and img folder into your theme folder (any empty folder will do but it’s worth noting that if you include numbers in the folder name it may not show in the WP dashboard). 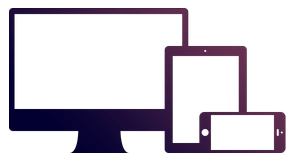 Once you’ve copied over those folders you will want to create 3 more files – functions.php, index.php and style.css. Put them all in the folder along with Bootstrap. Your folder structure should look like this. 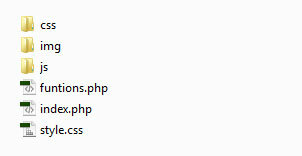 Add a functions.php, index.php and style.css file to the theme and copy the Bootstrap folders in. The first thing you need to do when creating any WordPress theme is add the required comment block to the top of the style.css file. This code tells WordPress that the files in this folder make a theme called My Bootstrap Theme, it’s version 0.1 of the theme and I’m the author. I’ve also imported the bootstrap.min.css file – the minified version of Bootstrap’s stylesheet – which includes the responsive stylesheet. The markup in the index.php file is very basic, it shows the site title and has a basic loop but that’s it. Paste this into the index file. Remember that Bootstrap requires you to declare an HTML5 doctype at the beginning of the head section. Doing that with HTML5 is pretty easy it’s just <!DOCTYPE html>. You need to have a viewport width defined too in your head section. That’s done like this: <meta name="viewport" content="width=device-width, initial-scale=1.0, maximum-scale=1.0">. Now all we need to do is add a couple of php functions to get our style and script included. Not surprisingly we add them to the functions.php file. Once you’ve done that you’re finished. You have a Bootstrap powered WordPress theme. It doesn’t look like much yet because we haven’t applied any of the Bootstrap styles to the markup but I’ll cover that in the next post. Eventually this theme will bulk up and become a completely functional styled theme. We’ll use the affix plugin to make some awesome floating social share buttons with Jetpack and we’ll make a responsive nav menu with a custom navwalker class – which adds glyphicons to menu items. Next time I will add some Bootstrap markup and make the theme look like a proper webpage. You have a small error in the index.php code , one of the <?php (at the end of it) is <?pho . Easy to find but doing this tutorial and seeing blank instead of ..something .. makes you think something you did was wrong . Ahh George, thanks for the heads up, I hadn’t noticed any errors in the code recently. Last time I tested everything was a few months ago and it all worked fine. It’s been a few weeks since I last updated code in the post so that means that I introduced the error then it’s not been working for that amount of time… hardly the best impression to give people who are looking for help. I will run through the tutorial today and fix any problems then confirm everything works as expected again. How can we include (support) bootstrap for our custom themes? Can I just copy over all files form bootstrap to my css file? Have a look in functions.php for lines that look like those that include your main style.css file and add it to the same function. And if you modify the register call for the main style.css file to set Bootstrap as a dependency of it then Bootstrap styles will always be included first (so you can do CSS overrides in the style.css file easily). Let me know how you get on and feel free to give me a shout via the contact form on the site. not only awesome instructions but also quiet fast!! I am building a ultra-minimlistic theme according to your instructions here. For the rest I use wp-types plugin, for the construction…. thank you again for this instructions here. I looked at your site and see an error notice at the moment though relating to an enqueue not being added at the right spot. The fix for that would be to add the enqueue inside a function. If you used this guide to start the theme then the function you want to add it too will be called ‘enqueue_my_styles()’. weird. could a renamed wp-content folder be the issue? Renaming that folder should cause much, if any, slowdown so it’s something else that’s taking up that 500ms. To be honest 500ms response time isn’t all that bad compaired to the average time. Faster than about 60% of sites tested from the US. I use this site to check response speed: https://www.200please.com and your site scores well. Since your theme is so minimal I can only assume that the 500ms is caused by either the plugins or by slow/badly configured hosting. I’d be interested to hear if you ever figure out how to improve your response time and what you found caused it. It varies each time you test the site. Your help was very great. I have found a error if you try to load a carousel with the functions used in this tut.